A follow up article from GTM Research says the report "details why these rooftops are “perfect" for solar PV projects. The reasons are obvious. 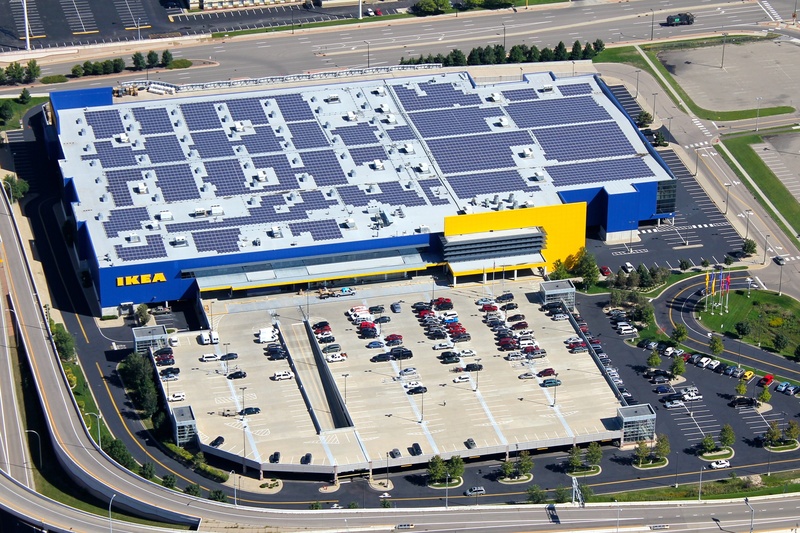 The rooftops of big-box stores are largely flat, vacant, and also plentiful". Big-box is defined as: Super stores, grocery stores and malls. These businesses account for 5% of electricity use within the U.S. and their buildings span over 102,000 locations with a total of 4.5 billion square feet. On average, Big-box stores spend $190,000 on electricity bills a year. Estimating that solar could offset electricity use by 42 percent, these business could be saving $8.2 billion annually. Big-box rooftops could host 62.3 gigawatts of solar energy capacity, the equivalent of more than 7 million homes. According to GTM Research's senior solar analyst, Nicole Litvak “The biggest bottleneck to developing these types of properties is the customer acquisition".